Break almond bark into squares. Place half the squares in a medium saucepan. Place saucepan over a pot of simmering water on the stovetop (to create a double boiler). Stir bark until melted. Using an offset spatula, spread bark in a thin, even layer on a parchment paper or wax paper-lined baking sheet. Transfer baking sheet to freezer; chill 30 minutes. Place remaining bark squares in a clean medium saucepan. Place saucepan over a pot of simmering water on the stovetop. Stir bark until melted, then stir in food coloring until mixture is a light blue. Carefully spread bark with an offset spatula over chilled bark on baking sheet. Sprinkle top with Boo Berry™ cereal; lightly press cereal into bark. Transfer baking sheet to freezer; chill 1 hour. Break up chilled bark into small pieces. I love Halloween: more for the sweets, though, and less for the spooky (no haunted houses for me, thankyouverymuch). I mean, what could be better than a day full of candy? That’s a rhetorical question. This Boo Berry Bark is a fun candy to make for Halloween that doesn’t just come from a bag at the store. It’s a great gift to give to friends and family to celebrate the day, for your kidlets to bring to school to share, or to munch on when you’re handing out more candy on All Hallow’s Eve. Like I said: I’m all about the sweets. First, gather your ingredients. 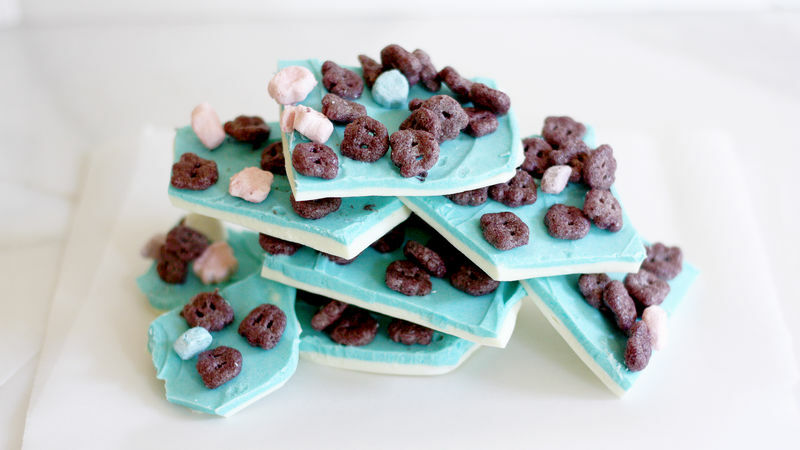 And by ingredients, I mean three simple things: vanilla almond bark, blue food coloring and Boo Berry cereal, which tastes like berries, has marshmallows in it and is so addicting that you may want to have an extra box around just for snacking. Ahem. Break the bark into pieces, then place half of it in a saucepan over a pot of simmering water (a.k.a., a double boiler, a.k.a., what makes the melting magic happen). Stir the bark until it’s completely melted. Pour the bark onto a parchment paper or wax paper-lined baking sheet. Use an offset spatula to spread the bark into a thin, even layer on the baking sheet. Transfer the sheet to the freezer to set for about a half-hour. When the first layer is set, place the remaining bark in a clean saucepan over a pot of simmering water. Once the bark is melted, add a few drops of the food coloring, stirring until the bark turns blue. Pour and spread the blue bark directly over the white bark on the baking sheet, then sprinkle the top with Boo Berry cereal. Lightly press the cereal into the bark so it stays put. Transfer the baking sheet back to the freezer to chill for another hour or so. Finally, break up the bark into pieces. And that’s it! A totally sweet, totally non-spooky, berry and vanilla-flavored treat for Halloween! Sounds to me like a great way to celebrate. Stephanie (aka Girl Versus Dough can’t wait for ALL THE CANDY. Check out Stephanie’s Tablespoon member profile and keep checking back for her own personal recipes on Tablespoon!